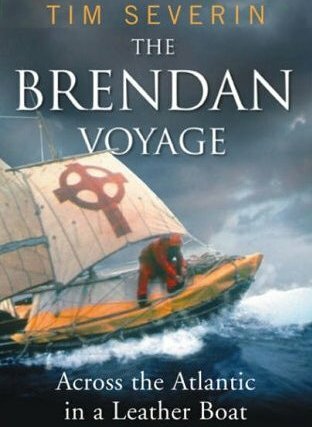 I was first came across the story of the Brendan Voyage in O.R. Melling's marvelous The Book of Dreams, in which Tim Severin and his crew appear as fictional characters. Some years ago I stumbled across The Brendan Voyage in a used book store and thought it would be entertaining, although it has taken me years to get around to reading it. In some ways it is a great follow-up to Simon Winchester's Atlantic. This story is part history, part sea tale, part adventure and part mystery. St. Brendan was a 6th century Irish monk who features in Navigatio sancti Brendani abbatis (the voyage of St. Brendan the abbot). For many years people thought his fantastical voyages to "promised lands" was the stuff of legend, but recent studies have shown that Brendan may in fact have visited real places, and maybe even North America, by island-hopping in the North Atlantic. In the 1970's scholar Tim Severin set out to prove that the traditional Irish curraghs could have withstood the arduous journey. I never would have thought I'd find boat-building fascinating, but I did. Severin had to use his medieval detective skills and assemble a crack team of experts in traditional boat-building skills in order to make it happen. Even in the 1970's, this proved difficult, as many of the traditional crafts were dying out. The boat itself was constructed out of all-medieval materials, using wood for the frame with a leather covering. The most astonishing thing about the boat was not the material, but the size. It was barely 36' long, but had to comfortably stow five men and all their supplies. Amazingly, Tim and his crew discovered that not only did their medieval boat hold up, in a lot of cases the medieval material fared better than its modern counterpart. Of course there were a lot of nail-biting moments, including several storms and a rather harrowing encounter with icebergs, but the little boat that could seemed to roll with the waves better than the bigger, modern boats. Intriguingly, they discovered that many parts of Brendan's tale that people dismissed as myth could have been true - for example, the "island of fire" might be the volcanoes of Iceland and the monstrous beasts could have been whales (who, incidentally, showed little fear of the boat and swam beside it for much of the journey). Even though Tim answered the question of whether Brendan could have reached North America, scholars are skeptical regarding whether he did. The question remains an intriguing mystery.